Corporate income taxes are levied by federal and state governments on business profits. Companies use everything in the tax code to lower the cost of taxes paid by reducing taxable income. The corporate tax rate is 21%. President Trump signed the Tax Cuts and Jobs Act on December 22, 2017. Trump's tax plan cut the corporate tax rate from 35% to the lowest rate since 1939. It raised the deduction on qualified income to 20% for pass-through businesses. This deduction ends after 2025. Pass-through businesses include sole proprietorships, partnerships, limited liability companies, and S corporations. They also include real estate companies, hedge funds, and private equity funds. The deductions phase out for service professionals once their income reaches $157,500 for singles and $315,000 for joint filers. The Act limits corporations' ability to deduct interest expense to 30% of income. For the first four years, income is based on EBITDA. This acronym refers to earnings before interest, tax, depreciation, and amortization. Starting in the fifth year, it's based on earnings before interest and taxes. That makes it more expensive for financial firms to borrow. Companies would be less likely to issue bonds and buy back their stock. It allows businesses to deduct the cost of depreciable assets in one year instead of amortizing them over several years. It does not apply to structures. To qualify, the equipment must be purchased after September 27, 2017, and before January 1, 2023. The Act stiffens the requirements on carried interest profits. Carried interest is taxed at 23.8% instead of the top 39.6% income rate. Firms must hold assets for a year to qualify for the lower rate. The Act extends that requirement to three years. The Act eliminates the corporate AMT. The corporate alternative minimum tax had a 20% tax rate that kicked in if tax credits pushed a firm's effective tax rate below 20%. Under the AMT, companies could not deduct research and development spending or investments in a low-income neighborhood. It installed a "territorial" system for global corporations. Under the territorial system, they aren't taxed on foreign profit. It encourages them to reinvest it in the United States. This benefits pharmaceutical and high tech companies the most. Under the prior "worldwide" system, multinationals were taxed on foreign income earned. They didn't pay the tax until they brought the profits home. As a result, many corporations reinvested profits earned overseas into those markets. It was cheaper for them to borrow at low interest rates in the United States than to bring earnings home. As a result, corporations became debt-heavy in the United States and cash-rich in overseas operations. The Act allows companies to repatriate the $2.6 trillion they held in foreign cash stockpiles. They pay a one-time tax rate of 15.5% on cash and 8% on equipment. The Congressional Research Service found that a similar 2004 tax holiday didn't do much to boost the economy. Companies distributed repatriated cash to shareholders, not employees. Federal tax rate of 35% for the highest income brackets. State and local tax rates ranging from 0% to 12%. It averaged out to 7.5%. Companies deducted state and local tax expenses. That averaged out to around 40%. But most large corporations never paid that much, thanks to tax attorneys who help them avoid paying more. On average, the effective rate was 18.6%, according to a 2017 report by the Congressional Budget Office. Here's another way to look at it. In 2015, the Treasury Department collected $390 billion. That's just 18% of U.S. corporate profits of $2.1 trillion, according to Table 1.12 of the National Income and Products Accounts. That's about half the effective rate the government received in 2007, the year before the recession. Corporate taxes were $395 billion on a profit of $1.5 trillion. 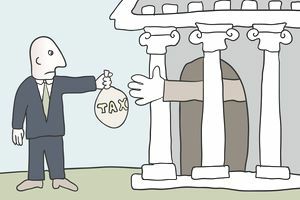 How do corporations avoid paying taxes? First, almost half of all corporations are "S" Corporations. These pass-through firms pay no corporate taxes. Instead, they pass corporate income, losses, deductions, and credits through to their shareholders. The shareholders are then taxed on these profits or losses at their individual income tax rates. Some global corporations don't welcome the tax change. They've become so adept at avoiding U.S. taxes that it was a competitive advantage. They made more money in U.S. markets than foreign competitors because of their knowledge of the tax code and how to get around it. Before the 1894 Revenue Act, taxes were levied on the individual owners of businesses, but not on the corporations themselves. Although the Act was ruled constitutional, it was replaced by a Tax Act in 1909, the first year that corporate taxes were levied. The maximum tax rates below are the rates paid on the highest income levels. Please note that the definition of income changes frequently, so keep that in mind when comparing rates. Until 1936, all companies paid the same rate, regardless of income. The current system is more progressive. 1916 2% Wilson Reduced tariffs and raised corporate. 1917 6% U .S. entered WWI. 1918 12% Taxes raised to finance WWI. 1922 12.5% Harding Lowered income tax and raised corporate. 1925 13% Coolidge Reduced income tax, raised corporate. 1929 11% Hoover Tax cut triggered stock market crash. 1930 12% Dust Bowl started. 1932 13.8% Tax hikes to stop speculation worsened depression. 1936 15% FDR Hike revived depression. 1938 19% Dust Bowl ended. 1940 24% Hike to finance WWII. 1942 40% Hikes to pay for WWII. 1950 38% Truman Cut to fight recession. 1951 50.75% Hike to fund Korean War. 1952 52% Eisenhower No cuts, despite 1953 and 1957 recessions. 1964 50% LBJ Implemented JFK's tax cut. 1965 48% Cut boosted economy. 1968 52.8% Hikes paid for Great Society and Vietnam War. 1971 48% Cut to fight recession. 1979 46% Carter Cut to offset high interest rates. 1987 40% Reagan Tax Reform Act. 1988 34% Cut to fight recession. 1993 35% Clinton Omnibus Budget Reconciliation Act. 2018 21% Trump Tax Act goes into effect. The corporate tax rate is 21%, the lowest level since the 1930s. Even so, most corporations don't pay that rate. They find tax loopholes so that their effective rate is just 18%. The Tax Cut and Jobs Act has made many changes to the tax code. It affects small businesses as well as corporations. Your best bet is to consult with a tax expert to see how it applies to your specific situation.